In areas with significant rainfall or humidity, good waterproofing sets apart great construction projects from the poor. When produced cheaply, waterproofing systems often increase the price that contractors and end users pay for a product because of the decreased longevity of the entire construction project. Cheaper waterproofing systems often uses inferior ingredients, is not adequately tested, is not durable, is not applied by manufacturer-approved installers, is not applicable on more than one material type, and does not provide quality finishes. 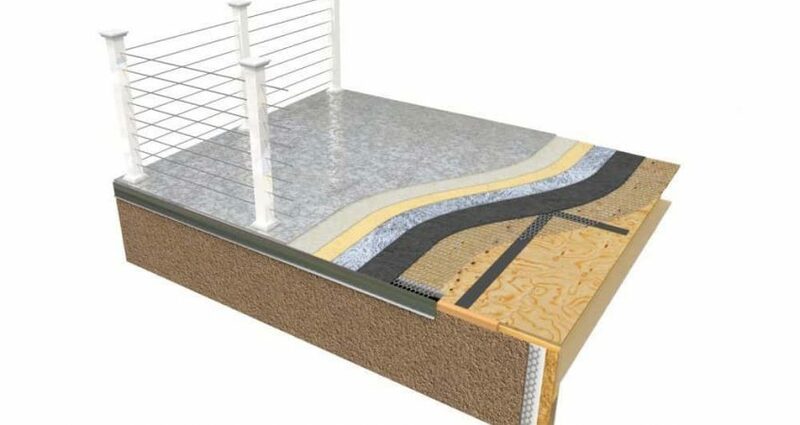 Proper installation of waterproofing for your deck requires quality ingredients in both the concrete, epoxy, or other sealant and all other products used in laying the concrete. The metal flashing, mesh base, and prep work are all integral ingredients to a high quality deck coating. When any one of these ingredients is of poor quality, it affects the quality of system on the deck. An unclean install site prevents proper setting of the base, and can cause cracking. If the wire mesh is improperly installed, the base will not hold to the deck. The flashing keeps water from coming in the seams of the deck. If the sealant is not made of high quality ingredients, the set will not be adequate to hold up foot traffic, may crack, and let in water. The quality of system needs to be regularly tested by users, installers, and producers. As shown by this amateur testing cell phone video involving a hammer on a deck sample, there are many aspects of a quality deck install that should be demonstrated to be adequate before selecting a product and installer. Cheap installs are done with a product that has not withstood the test of time (has the product been in use for at least 10 years? ), has not been tested for normal wear and tear, or been adequately tested for special situations. Vital to quality buildings, the deck coating needs to be as durable as the building it is attached to. Rather than being in addition to the lifetime of a building, cheap systems degrade faster than the rest of the building and contributes to reducing its lifetime. Quality deck coatings remain durable in heavy use, heavy rain, or large amounts of snow. Its durability is based upon the ingredients it uses, the quality of installation, and is producer’s commitment to stand by their product. Quality waterproof deck coating manufacturers work with their installers to ensure the best quality of installation, products, and customer service. This includes producing tutorial videos, brochures, and lists of approved service providers. Cheaper sealant manufacturers, on the other hand, target the consumer and ignore relationships with vendors and installers. This increases the cost of learning and decreases the viability of a warranty. While do-it-yourself and general contractors might be cheaper, the cost of poor waterproofing could be at the expense of an entire building. Cheaper systems are often a one-size fits all, this increases the cost of building quality by limiting the available options. High quality waterproof deck coating manufacturers have systems for each type of material to be sealed, from plywood decks to concrete floors and hardwood platforms. Each type of product requires a different type of system and type of application. The finish of your waterproofing affects the value of a building, to building users and owners. Different finishes provide aesthetic appeal and help create a brand for the building. High quality finishes take into account the materials the sealant is installed on, the surrounding materials, and the landscaping nearby to provide the best aesthetic appeal to a high quality project. With the right ingredients, service relationships, durable product and quality finish, slightly higher priced systems usually save money over cheaper competitors in both the overall building project’s lifetime and the increased brand value to users. For more information on installation of high quality waterproof deck coatings, please contact us today. Remember, $ now, could mean $$$ later.